MM.com: Hey Zack, How are you doing today? MM.com: Good deal, okay first off, why does everyone call you Zach? -ZO: Uh… That’s… my name. 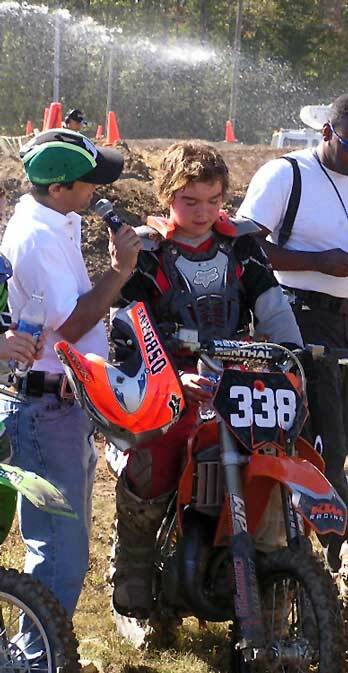 MM.com: I guess that makes sense, so what is your racing number, how old are you, and how long have you been racing MX? -ZO: 338. I’m 14, and I’ve been racing for 7 years. MM.com: Do you have any methods that you use to intimidate other riders? MM.com: Wouldn’t it be kewl if you bit off a bat’s head to psych yourself up, like Ozzy did, and since your last name is Osborne? -ZO: Yeah, well, but I’m not into that sort of thing. MM.com: Oh, well it was just a thought. Last year at you swept everyone, do you see a repeat of that? MM.com: You know what I’m talking about right. Vegas baby! Vegas! Sorry I’ve always wanted to work that into a conversation. MM.com: What is going through your head at the gate drop? -ZO: Let the clutch out, get your gears ready, and get off the line. MM.com: All about that hole shot huh? -ZO: Wait, This isn’t Kevin? MM.com: Umm… No, Kevin’s out driving his Viper. MM.com: Enough about that guy, so what do you do to keep in shape for racing? -ZO: I normally do about an hour and a half to about two hours of cardio every day, well three days a week at least. MM.com: Wow, that’s pretty awesome. -ZO: Yeah, and uh… and you ride and stuff like that. MM.com: Is there anything about MX that you dislike, like, or would like to see change? MM.com: Well, how about more money? -ZO: Yeah, but mainly some more outside sponsors. MM.com: That’s one of the best answers to that question I’ve ever heard. Can you tell me why everyone is trying to win a chance to be at a country music concert? -ZO: Win a …huh….What’s that??? MM.com: I keep hearing that riders want to qualify for Loretta Lynn’s, isn’t she that country singer chick that sang “The Gambler” and stuff? -ZO: Uhh… yeah…Loretta Lynn. Umm… How do I explain this. Oh, She was a Superstar Country Singer…. And she has…uh… the biggest race of the year. MM.com: So it’s like the Superbowl of Motocross? MM: Ohhhh, the world makes sense once again. What would you say is the most important thing when it comes to racing? MM.com: Do you have any advice for anyone new to the sport? -ZO: just practice good habits from the start and keep good habits…Just…uhh…stick with it and you’ll get there. MM.com: What bike(s) do you ride and what type of racing gear do you prefer? -ZO: KTM and I wear FOX. MM.com: Have you ever sustained and injuries riding? -ZO: Yeah, I broke my wrist, my arm, my collarbone, umm…I like…lets see, I injured my kidney and…that’s about it. MM.com: You’ve been described as extremely fast, how does it feel to know that you should have a guaranteed shot at the Pros? -ZO: Yeah it’s awesome…I hope I can fill my shoes…I guess. MM: Do you get a lot of support from your friends and family for racing? -ZO: Yeah. I do. I have this guy that goes to practice with me all the time, he helps me out a lot, my mom and dad, and my mechanic Al. I see. If you could have one of Captain M’s powers, which would it be? -ZO: Captain M? Who the heck’s that? MM.com: Errr… he’s only the biggest legend ever, but never mind. Do you have a favorite track? 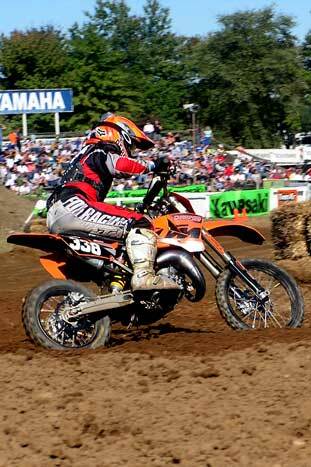 MM.com: Are there any Pro riders that have influenced your riding style? MM.com: So, do you have any hobbies besides racing? MM.com: How long have you been friends with Corporal Curtis? -ZO: I…uhh..don’t know who that is. MM.com: Man, you sure are a little out of the MX loop. Well maybe not. I’ll set you up with a meeting with Captain M and Corporal Curtis, can you meet me in Downtown Vegas tomorrow? Details schme-tails, I got the hook up, I’ll talk to the Black Socks Emperor and hive you hizz-up on the down lizz-up, know what I mean? MM.com: Oh, I’ll work on it. Well, thank you very much for you time; we look forward to seeing you at Loretta Lynn's Concert, good luck Zach.